Adventure travel and photography blog by photographer Braden Gunem of Kethcum Idaho and Crested Butte Colorado. » Deepest cave in America goes deeper. This past July, a group of core American cavers spent 10 days exploring and mapping remote alpine caves in the Bob Marshall Wilderness of Montana. With a surveyed depth of 1,659 ft, “Tears of the Turtle” is the deepest cave in the continental U.S. It is the first 500 meter deep limestone cave in the U.S.A., and on this expedition was pushed further than ever before. 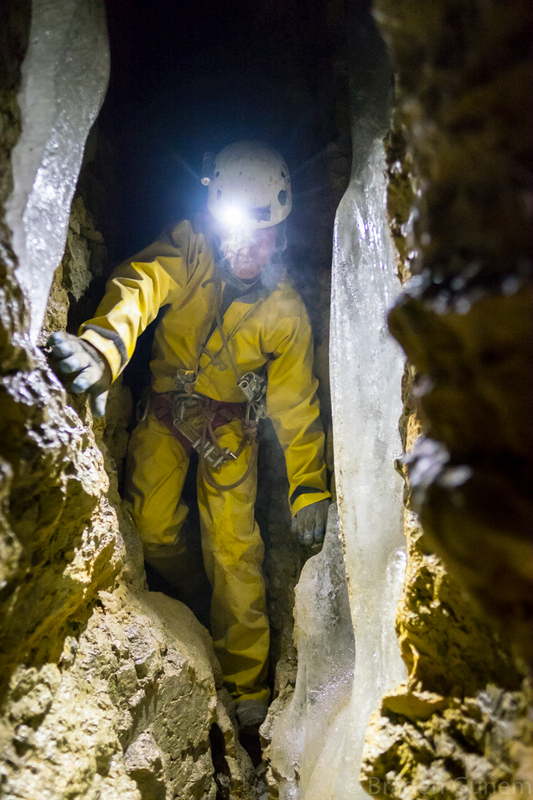 “Tears”, as it’s known to cavers, became the deepest cave in 2014. At this time, the survey team surpassed the depth of previous record holder, New Mexico’s Lechuguilla cave, by a few feet. On that expedition, the team was halted at a passage of bottomless mud they named the “Slough of Despond”. Expedition leader Jason Ballensky recalled, “It’s the kind of mud you worry about getting stuck in and not getting out,” and getting stuck in cold, sloppy mud at the bottom of “Tears” is not a place a person would ever want to be. It’s the total opposite of climbing El Capitan, where one can simply retreat back to the bottom if something goes wrong. “Tears of the Turtle” isn’t the glamorous cave pictured in one’s mind. There are no giant passages filled with beautiful formations; just an endless narrow crack descending into the abyss. Exploring this cave is Difficult with a capital D. Arguably the most remote spot in America, the hardest part isn’t the 22 mile wilderness approach; it’s not the sheer difficulty of descending the 49 ropes through tight, sharp, icy 37 degree fahrenheit passages of sludge. It’s mostly the task of hauling a cold and mud covered self back up the 500 meters to the surface with barely functioning ascenders jammed with goop. A rescue from the bottom is unthinkable. On this expedition, there was an advanced camp deep in a borehole passage above the previously unsurpassed mud pit. The camp provided the extra margin of safety and time needed to explore deeper. Two teams of three cavers each spent three days underground, and used the middle day for an attempt to explore deeper. Several other cavers hauled gear to and from the camp in support of the mission. Since the 2014 trip, plans emerged to surpass the “Slough of Despond” and an extra 1000 feet of rope was brought for what lay below. One plan involved bringing “mud shoes”, a sort of snow shoe device made for glacial mud flats. These quickly proved useless. The first descending team spent most of their efforts aid climbing the wall of the passage to surpass the mud. Beyond that obstacle, the team found more tight passages that continued mostly horizontally. Hardly the dream borehole passage everyone had hoped. Altogether, the teams combined surveyed 600 feet of new passage that descended only 30 feet. « Bosawás Biosphere Reserve – Following a river through the rainforest of Nicaragua.